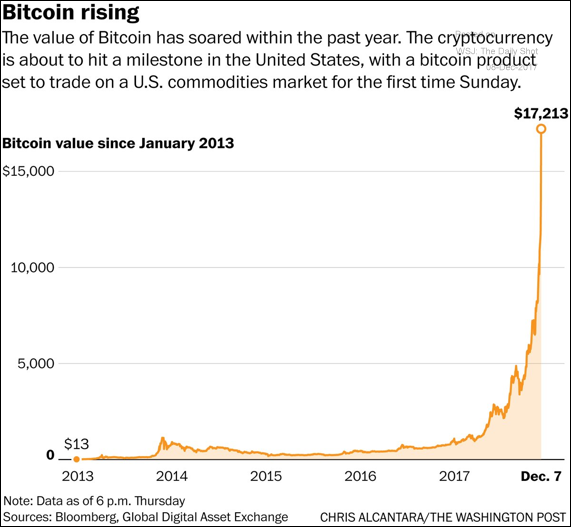 Bitcoin mania continued this week as the cryptocurrency continues to go parabolic in a move that is sure to surprise many. Futures contracts on Bitcoin will start trading next week which should be interesting as it may increase volatility as Wall Street traders get involved. There has been talk on shorting bitcoin to contain the price but that may be like throwing a firecracker at a freight-train. The market cap of bitcoin is something like $270B which is crazy to me but there are those that say it will go higher. If you are looking for a mania then you have found it. What is the worst that can happen from this craze? Seeing Bitcoin go higher and higher. As the dollar price of bitcoin rises, newer crypto-currencies are appearing that may be less secure and easier to steal. Did you hear that $70mm of bitcoin was stolen last week? Yep, hackers can get into your bitcoin wallet if they unlock the “key” that secures it in your name. Once it is gone, there is no insurance to cover your loss or government to put someone in jail. 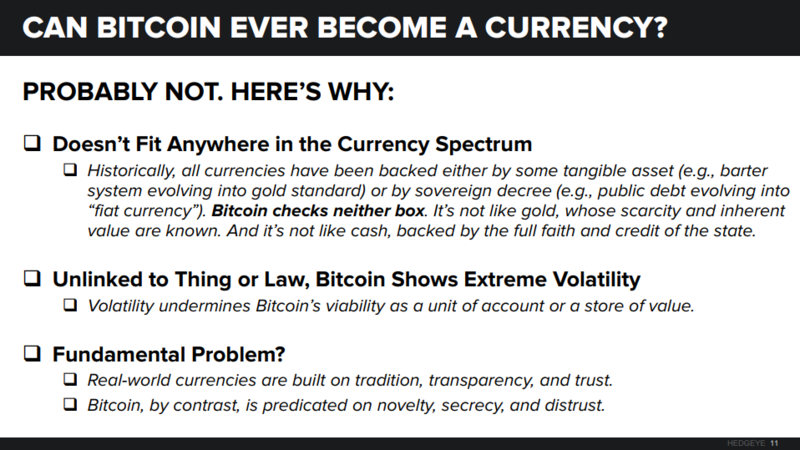 It is gone forever without a trace and that is why criminals love bitcoin. Just imagine this craze going on for another 12 months with more and more people buying the next cryptocurrency in hopes of seeing it skyrocket like bitcoin. In fact, there are now over 200 cryptocurrencies that have a total market capitalization of $435B (coinmarketcap.com)! As you can see, the more people that get dragged into the cryptocurrency pyramid, the bigger the bubble becomes. And where would that total market capitalization be one or two years from now as this pyramid grows? That would be the monster of all bubbles but we will wait and have to see how this plays out. It certainly is reminiscent of the dot-com craze but it may just be getting started given how many new currencies have been created in the last few months. Stay tuned as I think this will be in the news more and more in the coming months. 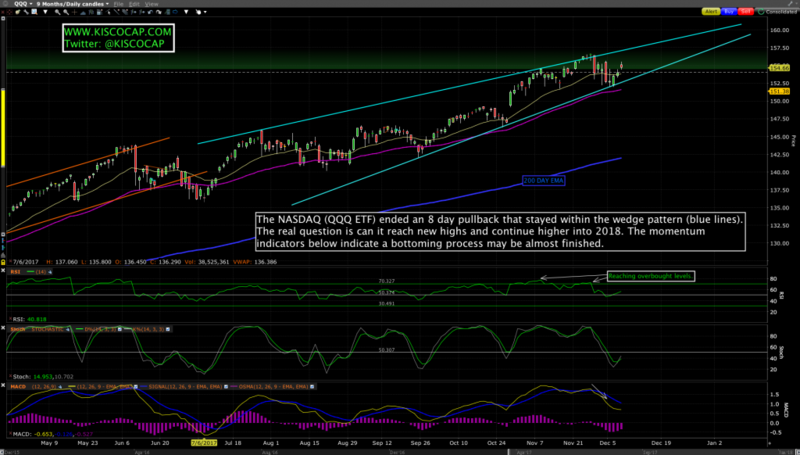 Will this drag stock markets higher? Not directly but the manic price action in bitcoin does parallel the complacency and low volatility we are seeing in the stock market. Two-year euro zone government bonds have raced below zero this year: most governments can borrow at an even lower cost than the European Central Bank’s deposit rate. Yields are being driven lower as the ECB continues to expand its balance sheet by buying bonds. Bank of America may be looking into cryptocurrency exchange services for its corporate clients. In a patent awarded by the U.S. Patent and Trademark Office on Tuesday, the second-largest bank in the U.S. outlined a potential cryptocurrency exchange system that would convert one digital currency into another. Further, this system would be automated, establishing the exchange rate between the two currencies based on external data feeds. The patent notes this service would be for enterprise-level customers, meaning that if the bank pursues this project, it would be offered only to businesses. General Electric, the American industrial conglomerate, has announced plans to slice 12,000 jobs including 1,100 in the UK as part of an effort to cut $1B in costs. The 125-year-old company said the cuts would affect both professional and production employees. They are aimed at helping GE reach its target of removing $1B in structural costs in its struggling power unit in 2018. A U.S.-based Volkswagen manager who oversaw emissions issues has been sentenced to seven years in prison and fined $400K by a judge for his role in the company’s Dieselgate scandal. The decision will make VW’s Oliver Schmidt the second employee to face jail time in the U.S. related to the conspiracy to deceive customers and government officials. Spotify and Tencent have struck a deal to acquire minority stakes in each other as the world’s largest music streaming services partner up ahead of public listings planned for next year. Spotify operates in 61 countries, but not yet China. The European Union is set to agree on a blacklist of tax havens that could potentially face sanctions for failing to bring their standards in line with the bloc, as it seeks to further step up its fight against opaque practices that facilitate avoidance by multinationals and individuals. Consider high taxation on cigarettes as a form of prohibition and you get the idea from the chart below. Criminals own all the products that are prohibited by the government. 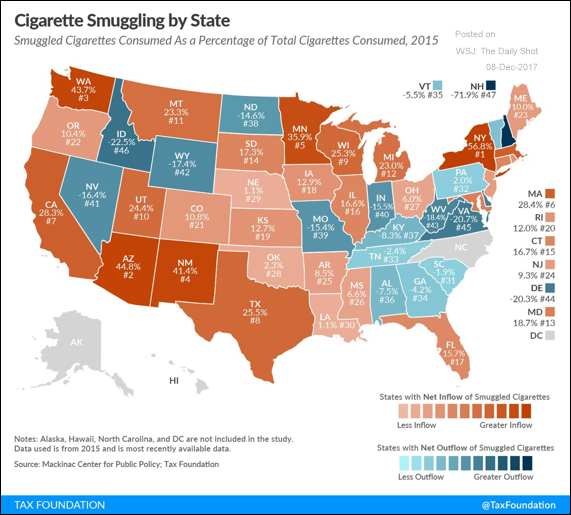 Each state taxes cigarettes at different rates, by the way. 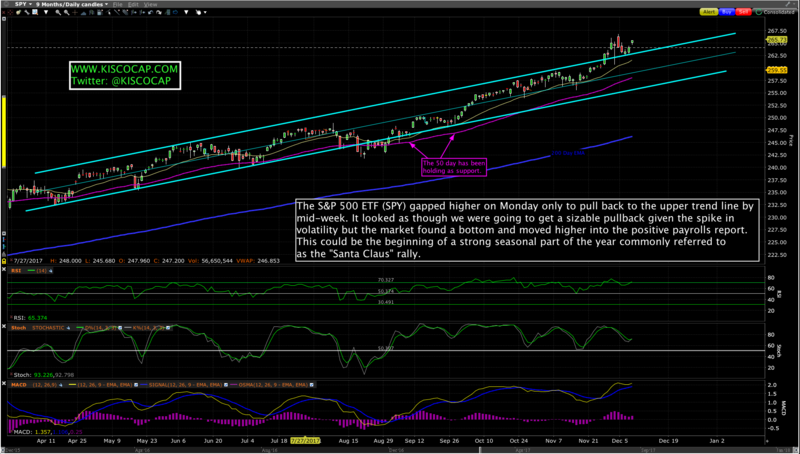 That is all for now until next week’s Market Update. Please reach out to me if there is anything you want to discuss about the markets, your portfolio (for clients) or if you would like a copy of the firm’s brochure if you are not a client.